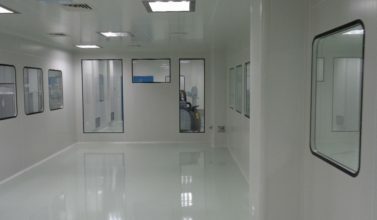 Containment issues are an increasingly important aspect of pharmaceutical production, especially when it comes to highly potent and toxic active pharmaceutical ingredients (APIs) for various applications. Improvement in product quality, reduced operating costs and longer production runs are just some of the advantages, as is the benefit of protection to product, operator and environment. However, safety is a concern not only during production but also during material transfer from one process system to the other. The material transfer interfaces must function safely and should be easy to handle and operate. These interfaces are one of the weakest links in the entire production sequence with respect to material exposure to person and environment. Material transfer devices are designed for contained product transfer for various applications like tablet and capsule manufacturing, injectables, API and other customised solutions. Flexible bags or continuous liners can be used for OEL levels up to 10-20 microgram/m3 with some add-on accessories. The system has two layers for added protection against accidental damage. The basic material of construction is antistatic polyurethane. The open end of bag/ liner is secured either via mechanical or heat sealing post material transfer. Fabtech also supplies special customised tools designed to minimise material exposure during mechanical or heat sealing. The system can be used to handle a small amount of materials during the intermediate stages of the manufacturing process and final product packaging for potent bulk drugs. Split Butterfly valves can be used for OEL level 1-10 microgram/m3 as standard execution and performance can be improved with the addition of a vacuum system for customised applications. The basic material of construction is SS 316L. Split butterfly valves are made of active and passive sections with each section comprising one half of the butterfly disc which is sealed against the main body with a suitable sealing mechanism. Split butterfly valves are primarily used to transport large quantities of materials during intermediate stages of manufacturing. The active section is always fitted on to the containment system and the passive section is fitted on to the material transfer container. Depending on the process requirement, we utilise mobile lifters, lifting, positioning and tilting devices with trolleys to make the entire materials transfer system user-friendly. Adequate mechanical system and interlocks are built into the system to ensure proper docking and to avoid any accidental exposure of materials. The split butterfly valve mechanism is available from 50 mm dia to 150 mm and can be utilised for various customized applications. 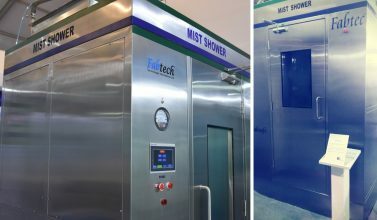 Fabtech has executed tablet and capsule manufacturing, API and customised containment projects using split butterfly valves for material movement conforming to various OEL requirements. Rapid transfer ports can be used for OEL < 1microgram/m3 as standard execution to transport materials in small quantities during manufacturing and for aseptic applications as well. The primary material of construction for RTP is SS316L. RTPs consist of Alpha and Beta sections. The alpha section of the port is fitted on to the containment system while the beta section is attached seamlessly to the material transfer container. The alpha section has a built in mechanical lock and the port can only be opened once the beta section of the port has been properly docked as well. The material of construction for the beta section of the port is application specific and available in standard sizes of 105 mm, 190 mm, 270 mm, 350 mm and 457 mm clear opening. It is available from non-metallic construction to SS316 L which can be autoclaved. The length of the beta container is designed based on the quantity of materials to be handled, taking into consideration docking is a manual operation. Height adjustable mobile carts are used for ease of operation and material transportation. 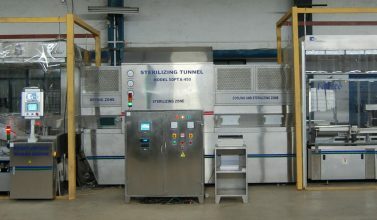 RTP solutions are available for different applications, specifically aseptic applications like rotating RTP for detaching aseptic filtration vessel from filtration isolator and docking to a filling machine, sterilisation of materials in an autoclave etc. Manipulation devices or combinations are chosen after careful consideration of various processes involved for the specific application. These manipulation devices, when used with appropriate vacuum transfer system, can meet almost all the requirement of contained material transfer. Fabtech offers all these solutions from a single source. We manufacture and supply isolator and processes and they are developed together to sync perfectly with each other. Talk to us about your concept planning and implementation of your next contained process application.